I have some grassy fields which I mow once a year so that they don't grow up in brambles, shrubs, and small trees. I have others for which I hire someone with a tractor and brush hog, but these areas are my job, as I very very slowly mow through high grasses. I try to treat the work as a time to relax and look out across the landscape, seeing it from points of view that are not my usual ones. 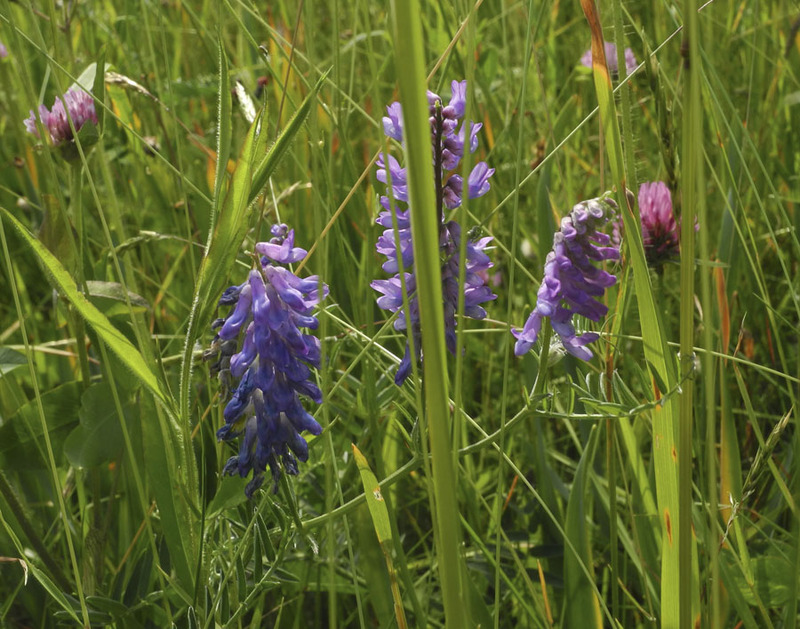 This year one small section of grass is vivid with wildflowers, common but beautiful. 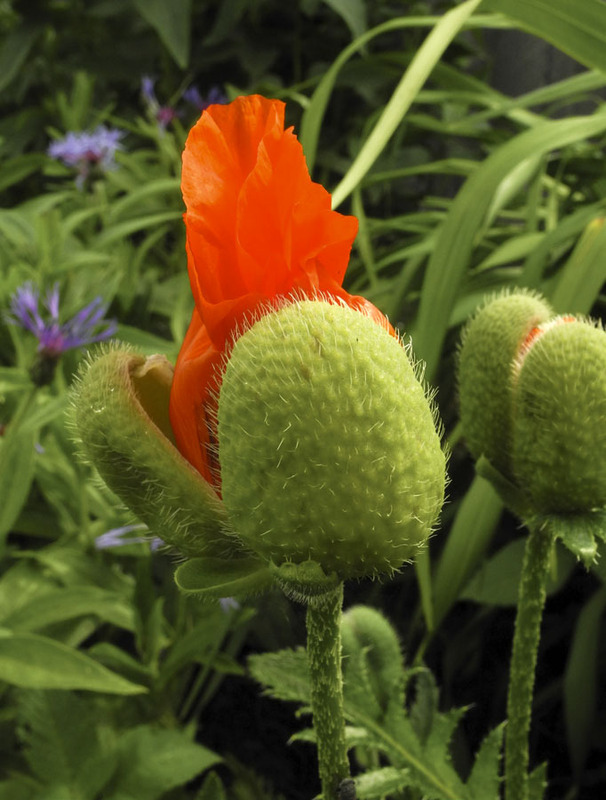 ....and the rich red-oranges of Devil's Paintbrush, what some folks around here call "Indian Paintbrush". 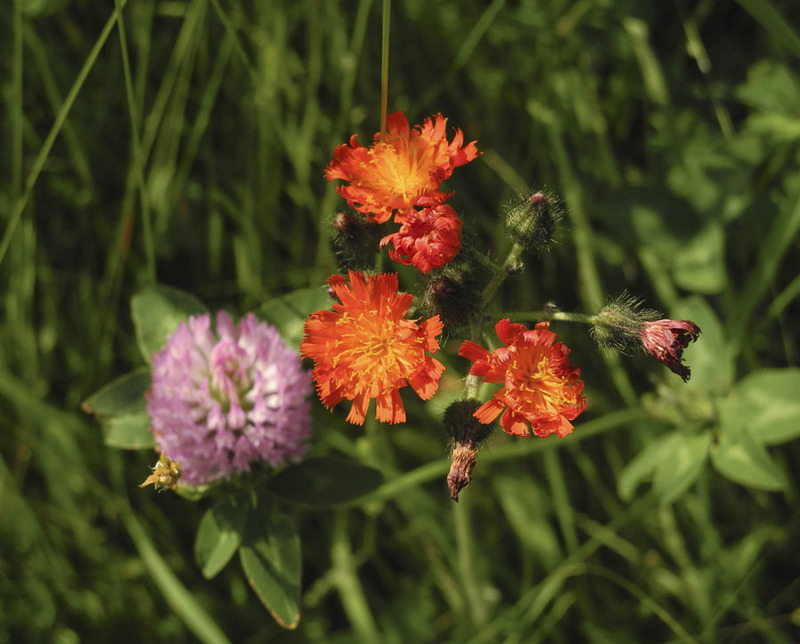 It is Orange Hawkweed, an introduced species. Of course there's lots of red clover. 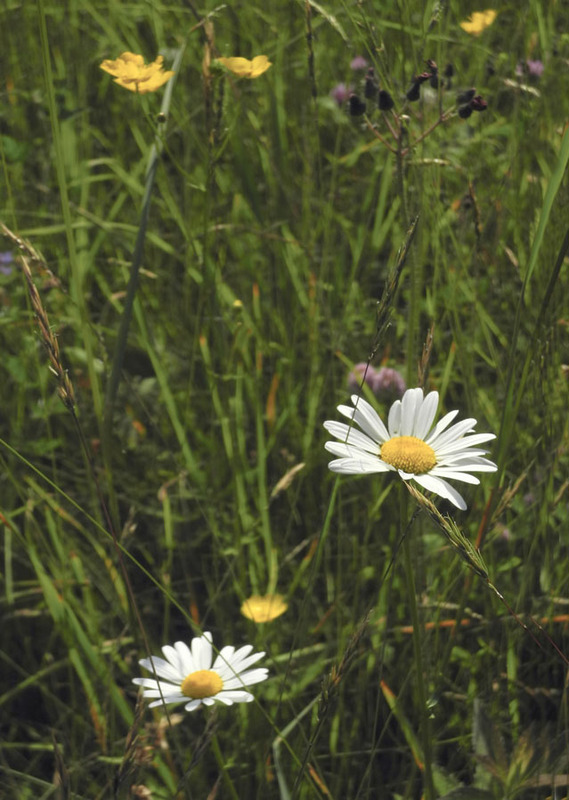 Not all the colors dotting the grass are intense, though the contrast of the bright white daisy petals with their rich yellow center does catch the eye. 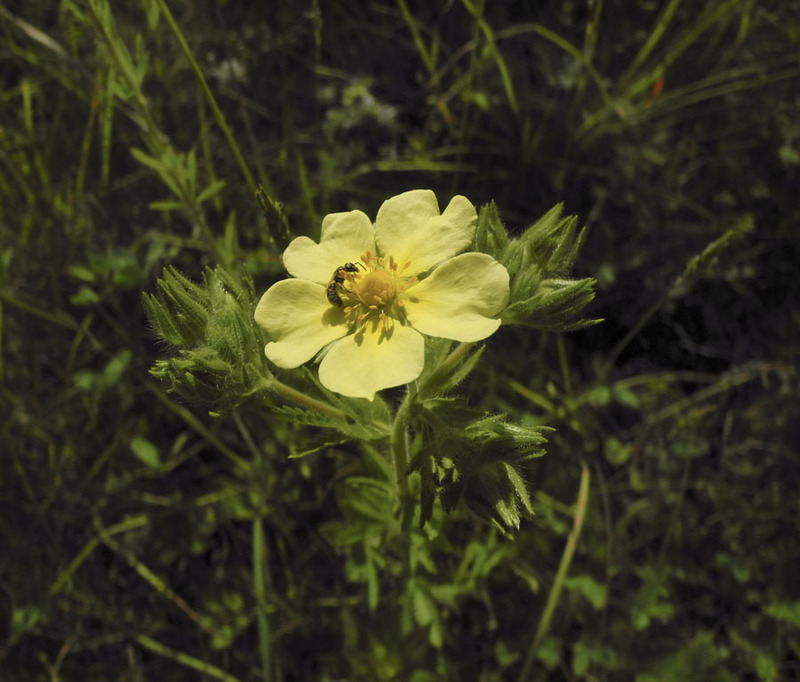 The delicate yellow of Cinquefoil has attracted a tiny bee. 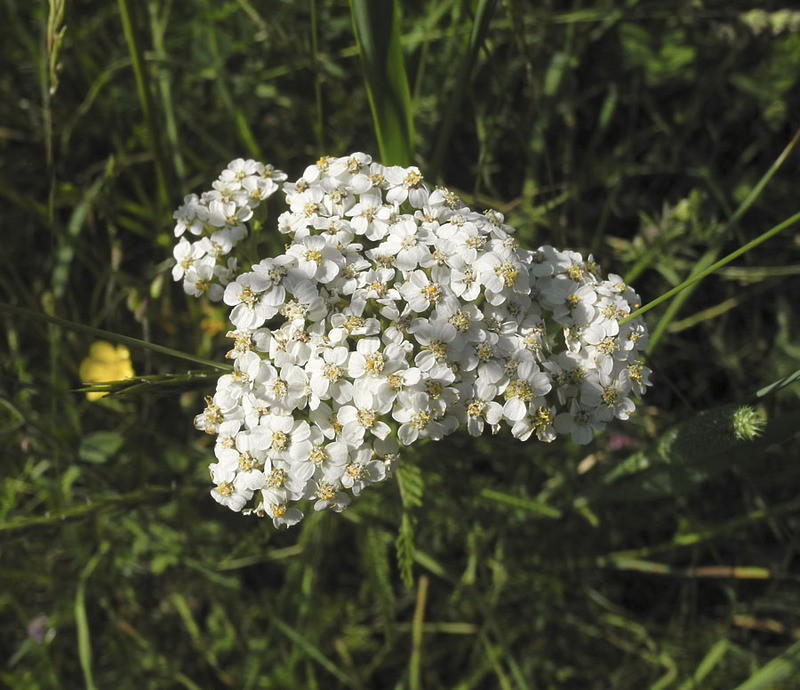 Yarrow's white is made up of many small flowers, each with its pale yellow center. The complex form of Columbine is a delight to see out in the field, popping up here and there, adding its juicy color to the greens. I also love its seedheads, ending in flowing pointed lines. 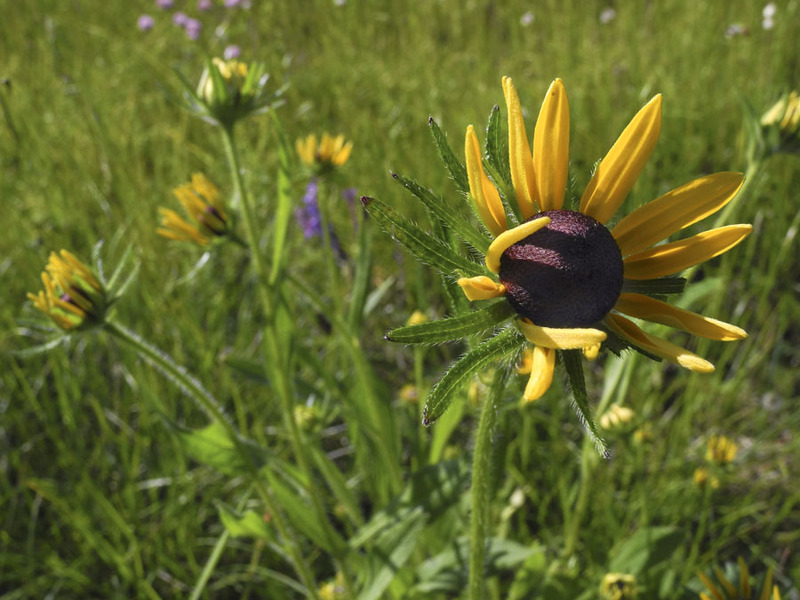 Black-eyed Susans are beginning to open their sunny faces. 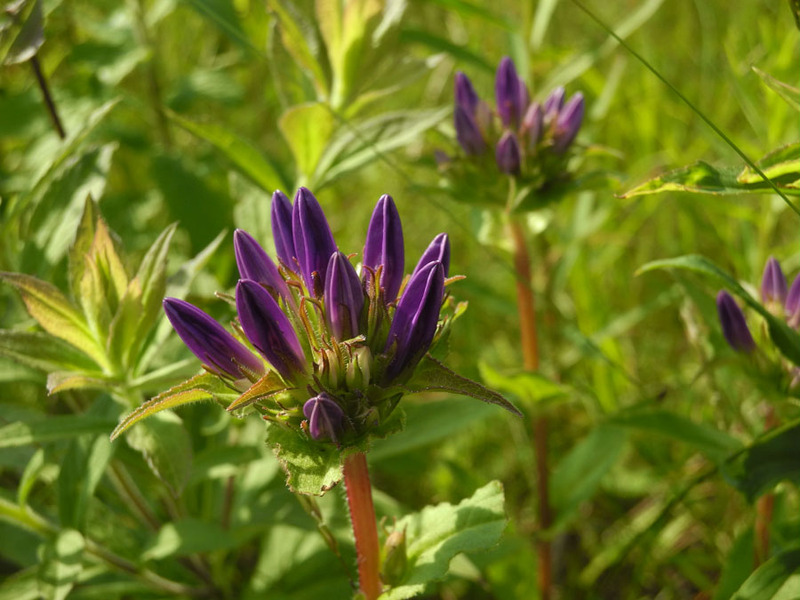 Another plant of royal purple, in bud. 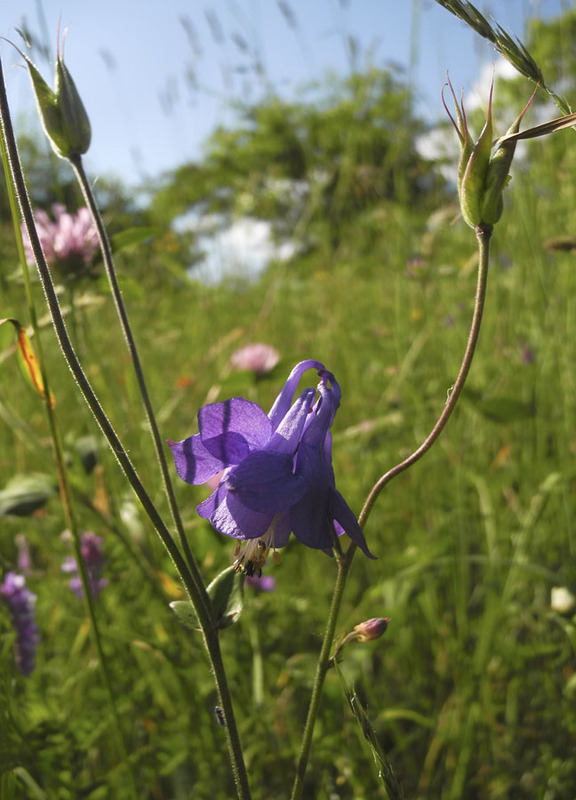 I was given some of this plant, which I believe is Campanula glomerata, by a friend; when it turned out to be invasive in the flower border, I tossed it into the grass, where it's been happily growing for years. 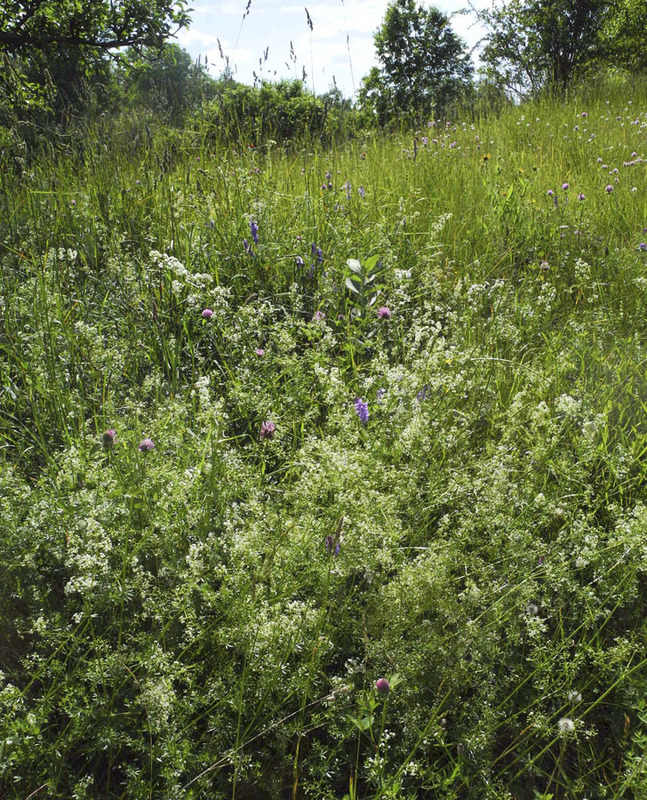 A frothy white mass, smelling sweetly under the apple tree: Bedstraw. 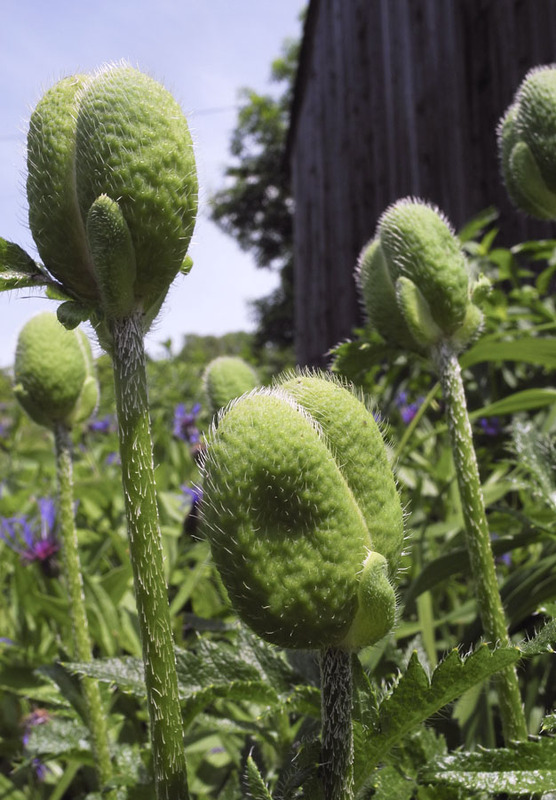 Milkweed is in bud, with a couple of flowers opening to show their cupped, waxy five petals. 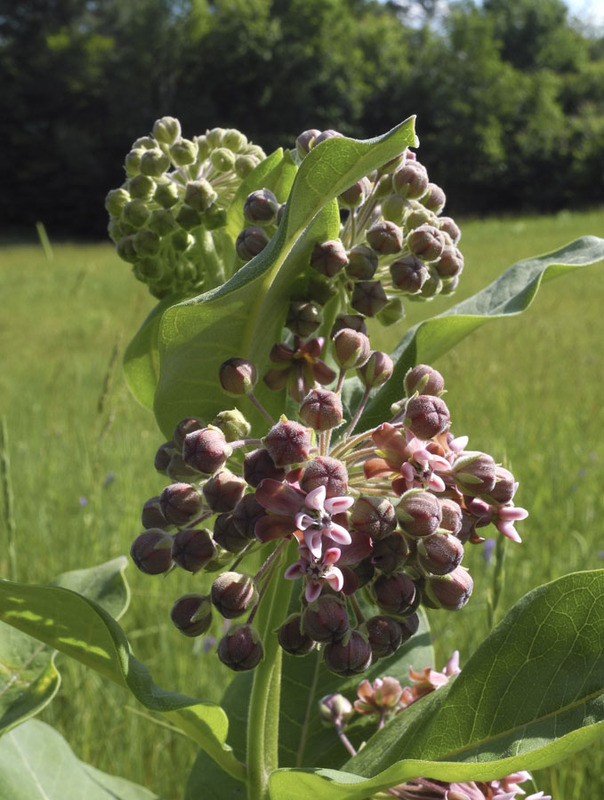 When the masses of milkweed are in bloom, the air is deliciously scented with their fragrance. I've discovered that by searing their cut stems, I can keep them in a vase and their fragrance will waft through the house. 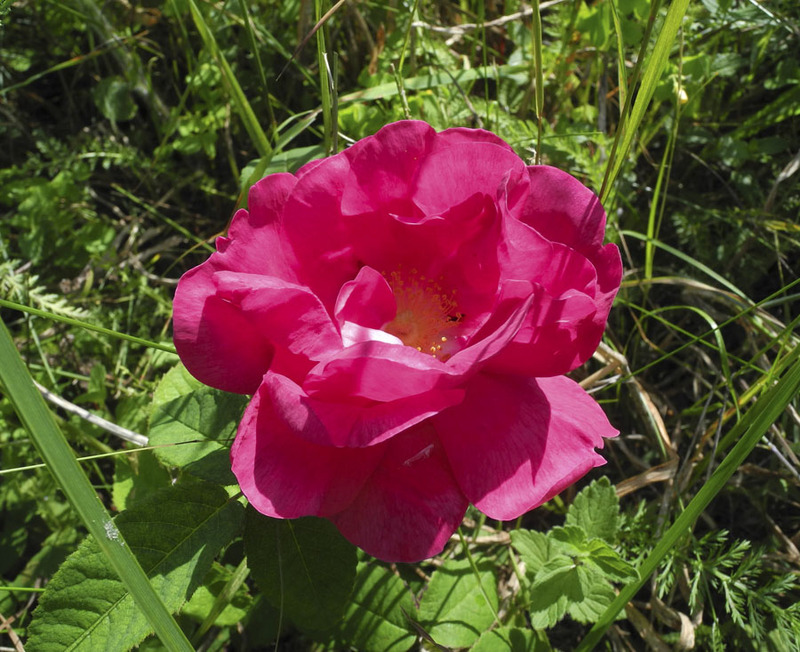 Many years ago when I first moved here, I discovered these rugosa roses growing in the grass. I dug some up and planted them on the east side of the house where they thrived, sending up 6 foot canes and producing many fragrant flowers. And there the original roses are, low in the grass from being mowed over each year. I think that this year I will mow around them and see how they do. This globe of light, like an enormous warm-colored dandelion, catches the sun as though it were spun gold. 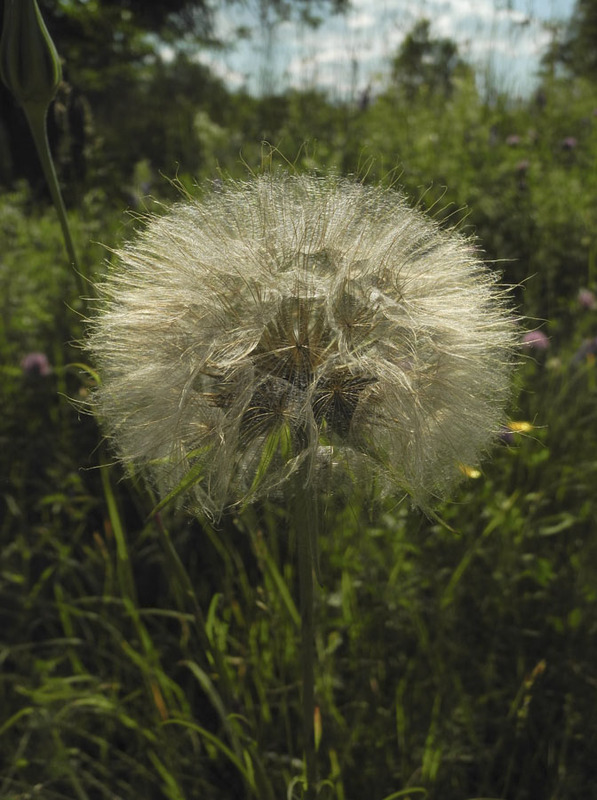 It's the seedhead of the Yellow Goats-beard, whose flower also looks like a dandelion. 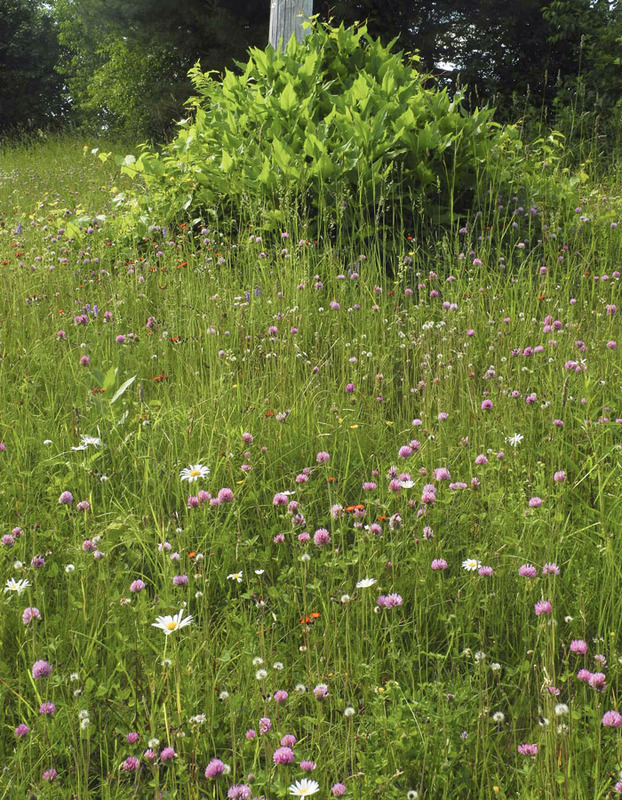 Each of these wildflowers is a pleasure to see, and there will be more to follow––Queen Anne's Lace, Jewelweed, Goldenrod––but in other fields, because, sadly, I have to mow this one in coming days. 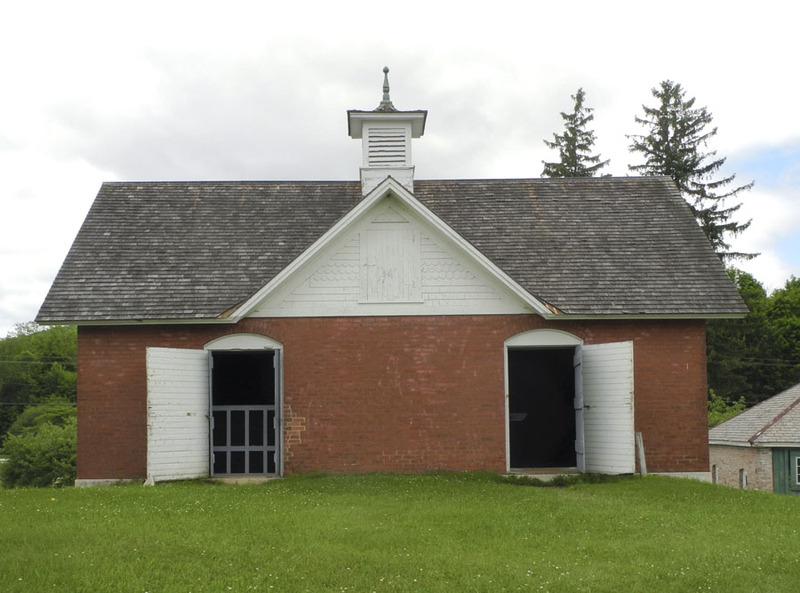 When you step out of the visitors center at Hancock Shaker Village, you are immediately aware that this had been a farming community, and that the tradition has been carried on by the museum staff and volunteers. As I explained in my last post on women's work, labor at the village was divided into those jobs done by women, and those by men. This is not very different at all from the culture at large, even through most of the 20th century. As in "the World", men did the hard work of farming. The agricultural implements of the 19th century are certainly different from those of today which are run with internal combustion engines. 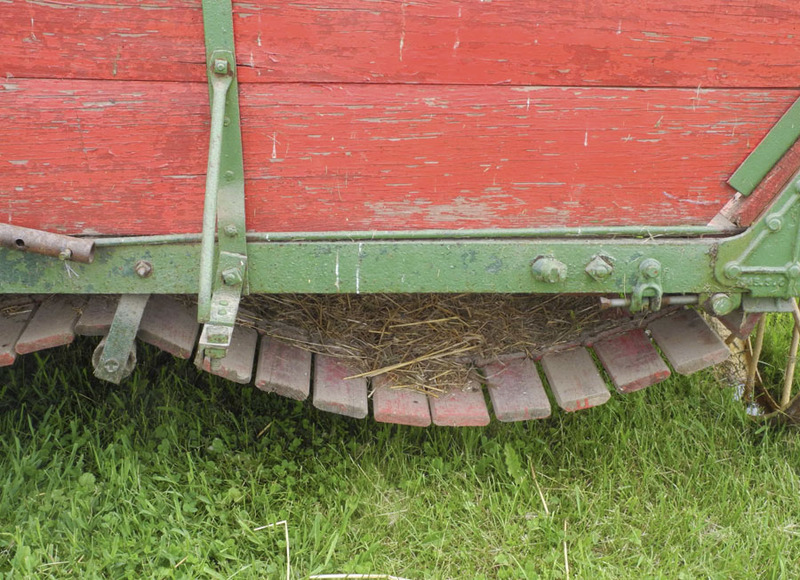 This wagon has some kind of rotating floor and I'm not sure of its purpose, but I love the way it looks. This moving floor is part of a horse treadmill, or "tread power". 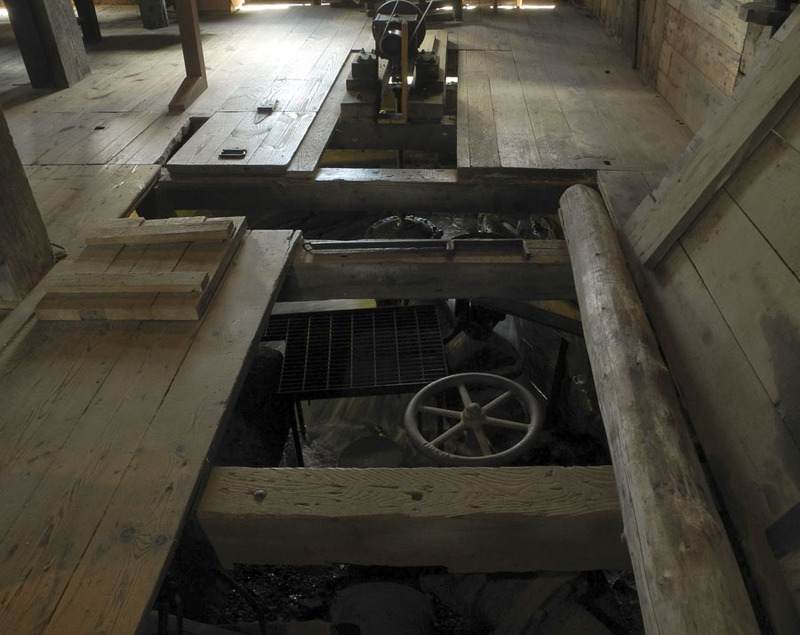 The Shakers used this treadmill to provide power for grain threshing, sawing wood, and for other large farm machinery. Smaller treadmills for small animals such as sheep were used to power butter churns, cream separators, and other small machinery. (from the museum label) Treadmills are an ancient technology, and I did find a modern treadmill for electricity generation: a farmer in Ireland developed one for his cows. 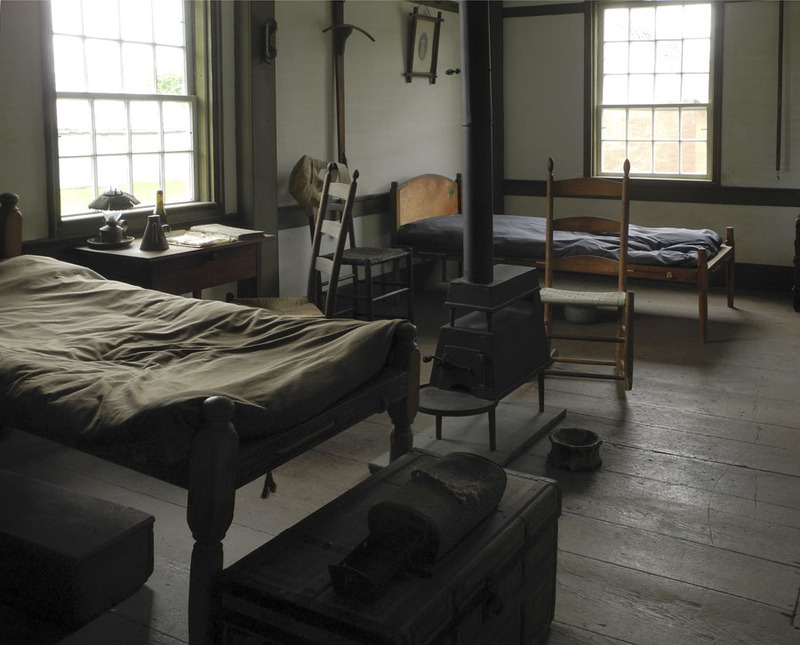 This is a room in the hired men's house. 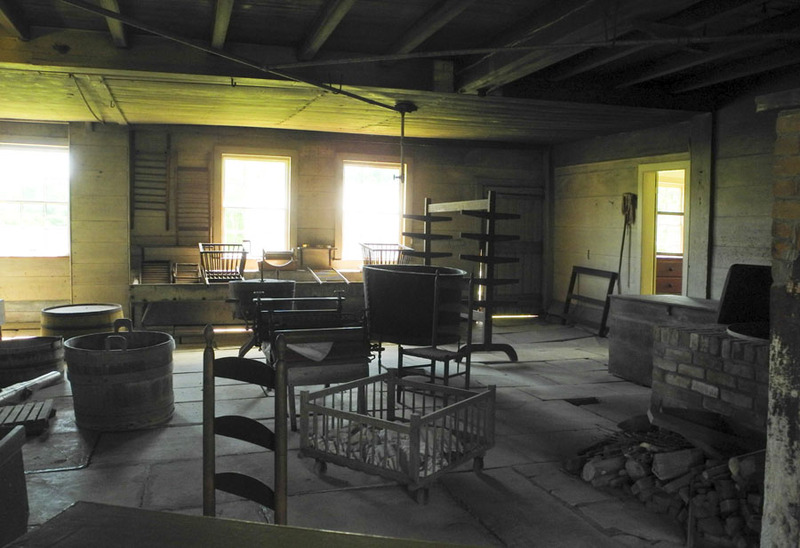 When the number of men converts in the community dropped in the mid 19th century, the Shakers had to hire from outside in order to do the work necessary to maintain the land and buildings. Workers lived here, separately from the community, until 1947. I find the proportions of this building, an ice house, very satisfying. It is built into a hill, so you are seeing only its upper half. This is the south facing side; the tallest wall is the one facing north, which would keep the building cooler. A large quantity of food was stored here to keep it fresh. Two hundred tons of ice were stored in this room and another small one above. If you enlarge the photo you'll see slots in the brick wall to enable the cold air to flow into the storage areas. 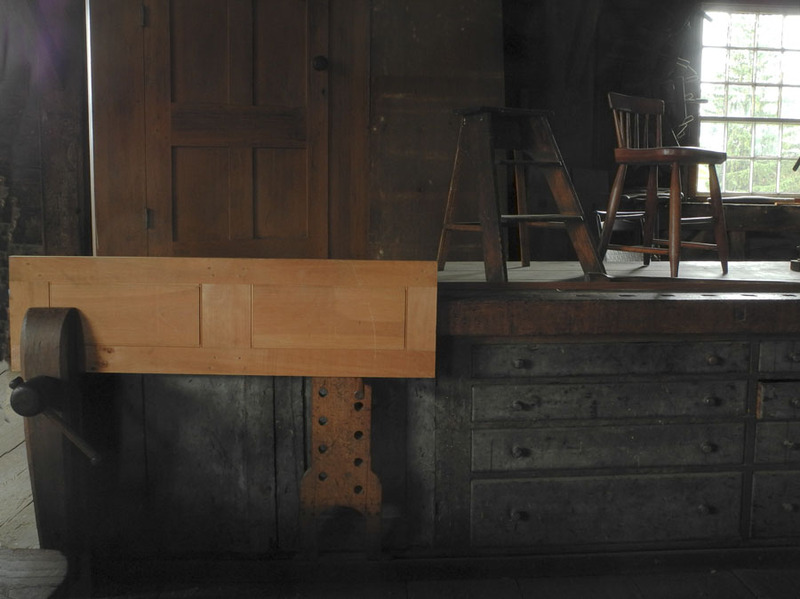 I thought the walls of this room were very beautiful, with the diagonal boards and the open grid. 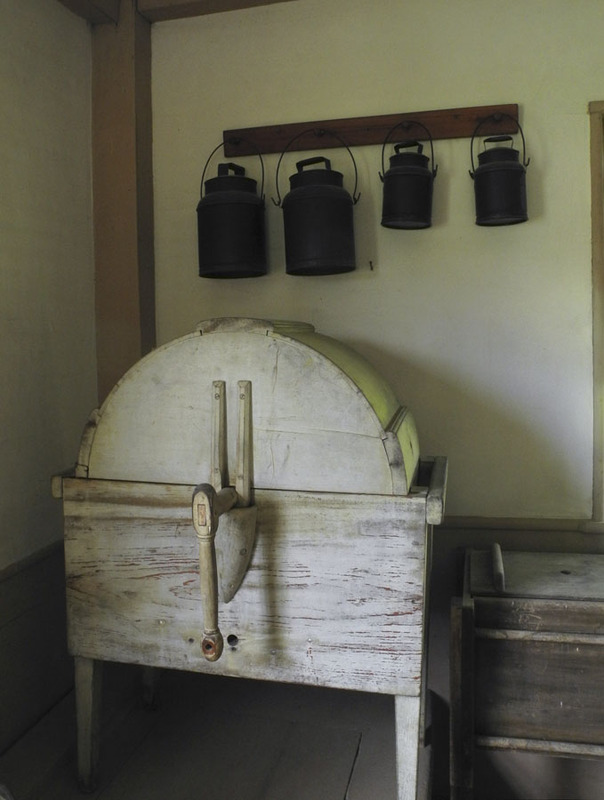 Ice was used until the Shakers switched to mechanical refrigeration in the early 20th century. 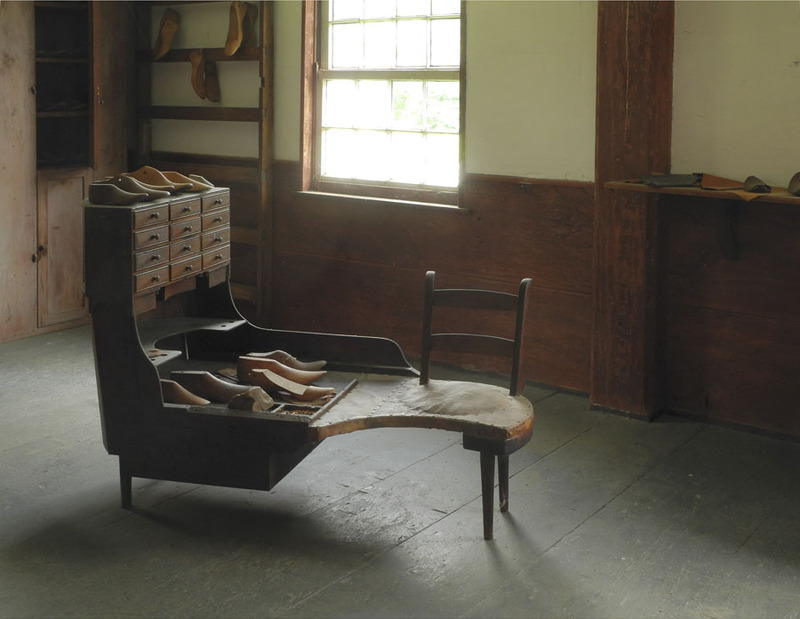 Shaker Brothers made shoes for the community into the 1800s. 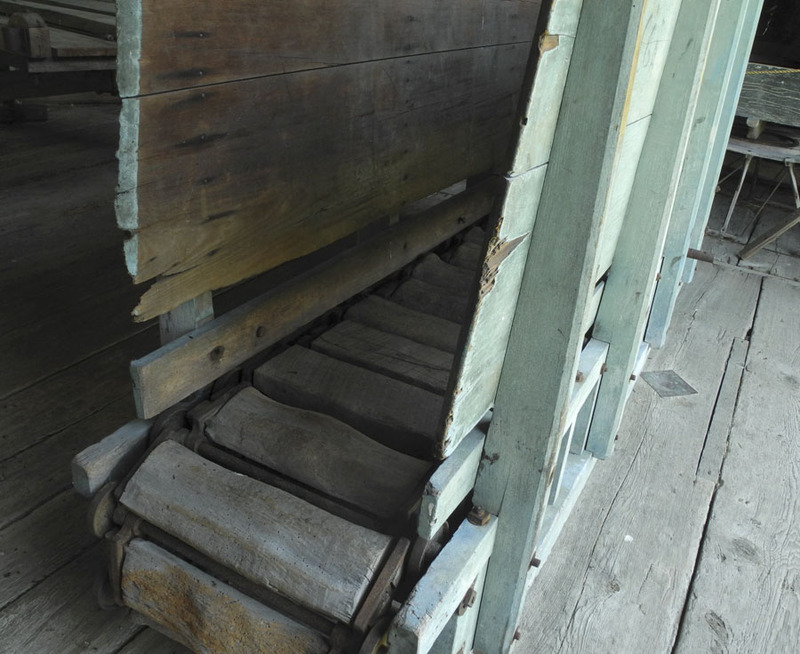 This bench was made in the 1840s at the New Lebanon, NY, community. Basketmaking was one activity that women also took part in. 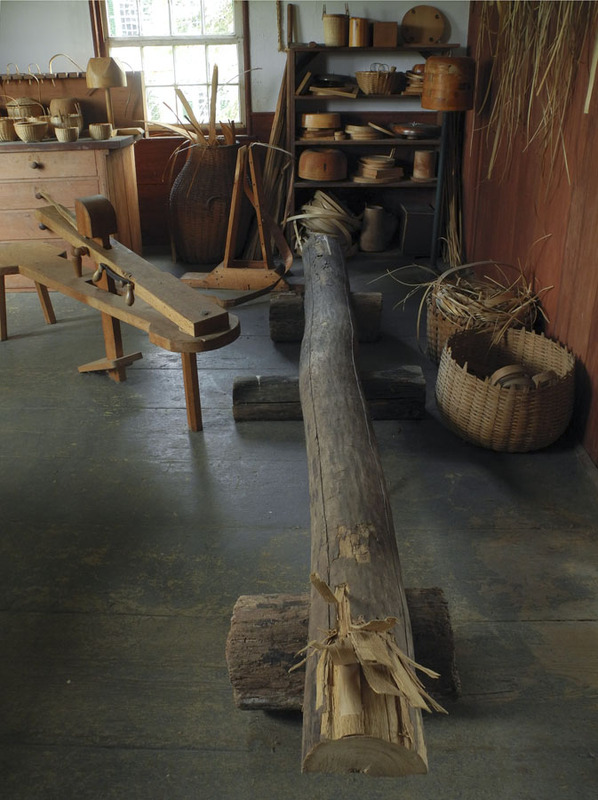 The men prepared the splints for weaving from ash logs and made the heavy work baskets, but women would make the most delicate ones. 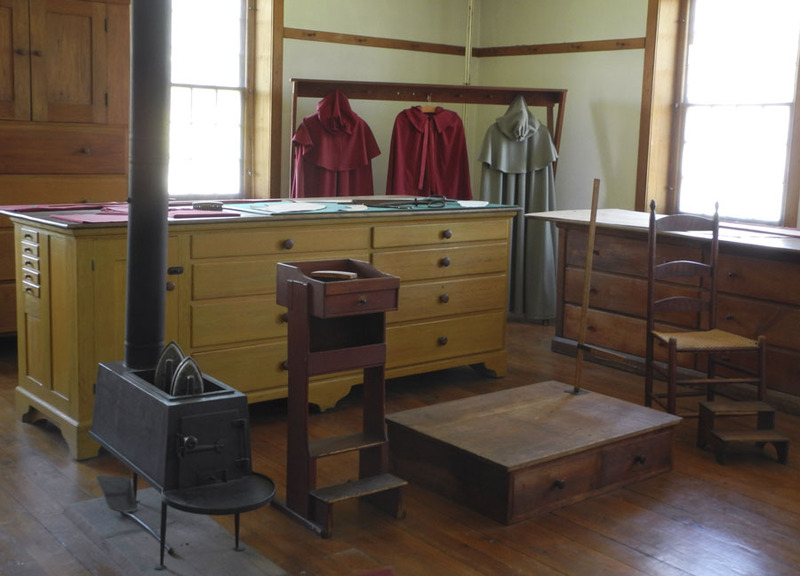 Shaker cabinetmakers were driven by the necessity of creating practical storage spaces that reflected the gospel simplicity required by their religion. Their methods of joinery were similar to those used by their neighbors, yet their designs and lack of ornamental elements were decidedly not of "the World". 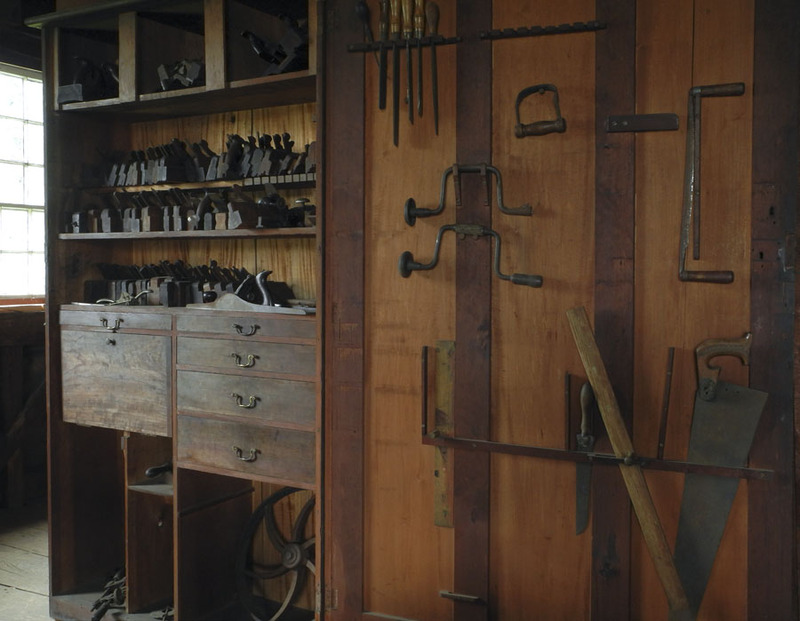 Beautiful, useful cabinets hold tools for woodworking. Finally, there is the machine shop, housed in a large building, in half of which was the laundry, run by women. 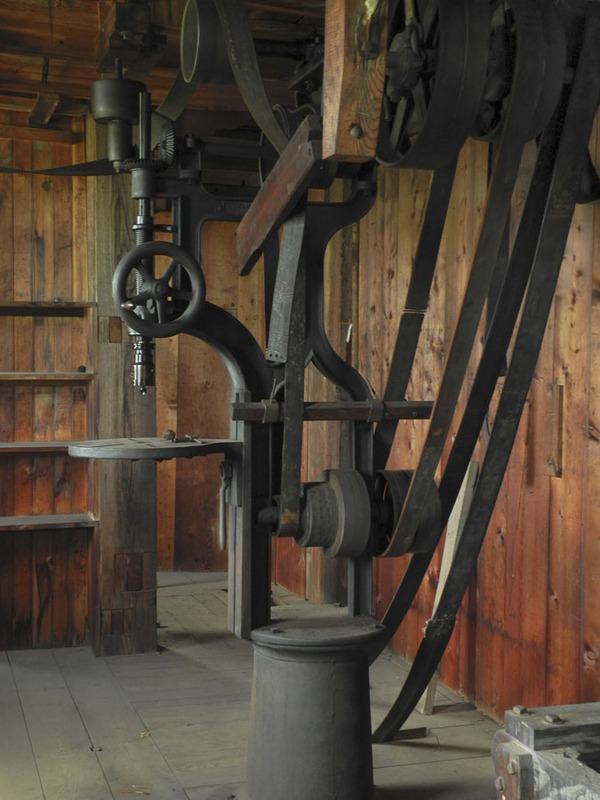 For some reason I find machine tools fascinating; I wrote about a machine tool museum in Vermont, The American Precision Museum, a couple of years ago. I suppose it's part of my visual interest in agricultural machinery, which provides me images for my paintings, because I don't like or trust power tools. 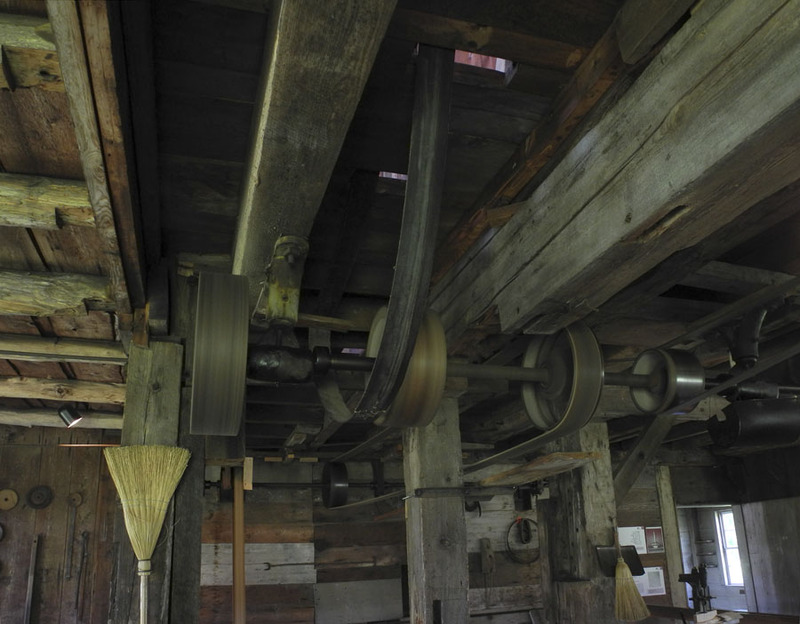 In this shop, saws and drills and lathes were run by pulleys and belts powered by water. Underneath the floor was a water turbine (earlier a water wheel) that was powered with water flowing through an underground channel from a reservoir north of the building. When I visited this building, I was lucky in having a knowledgeable docent who turned on the power; it was quite amazing to see how strong the water was. It then flowed out under fields, in a stone lined aqueduct of sorts, to a wooded area some distance away. Upstairs was a drill press that had been operated with water power. The belts are elegant linear elements alongside the curves of the machine. I thought I'd share this very touching photograph with you. It is a portrait of Brother Ricardo Belden, taken sometime around 1953. He was the last of the Hancock Brethren . 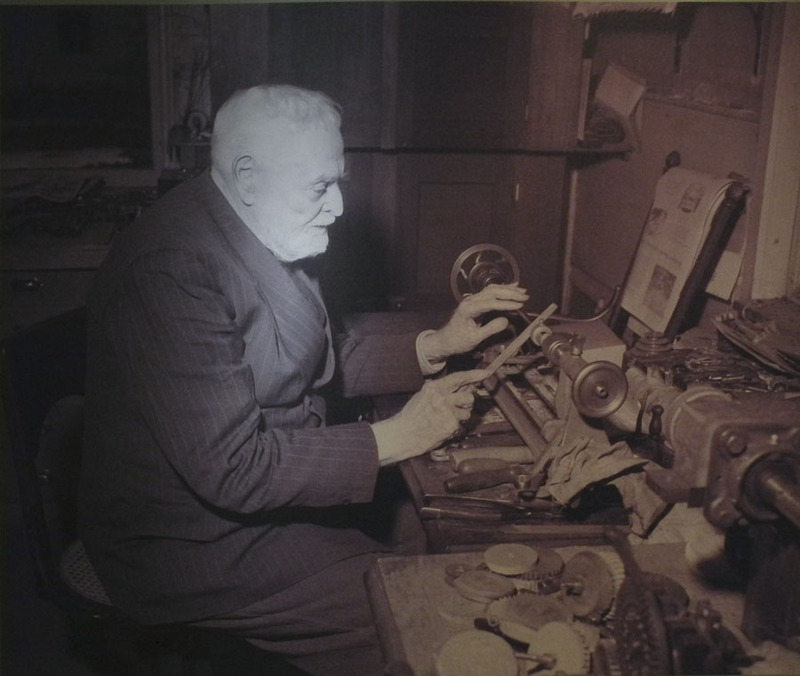 He worked in this clock shop until his death in 1958. 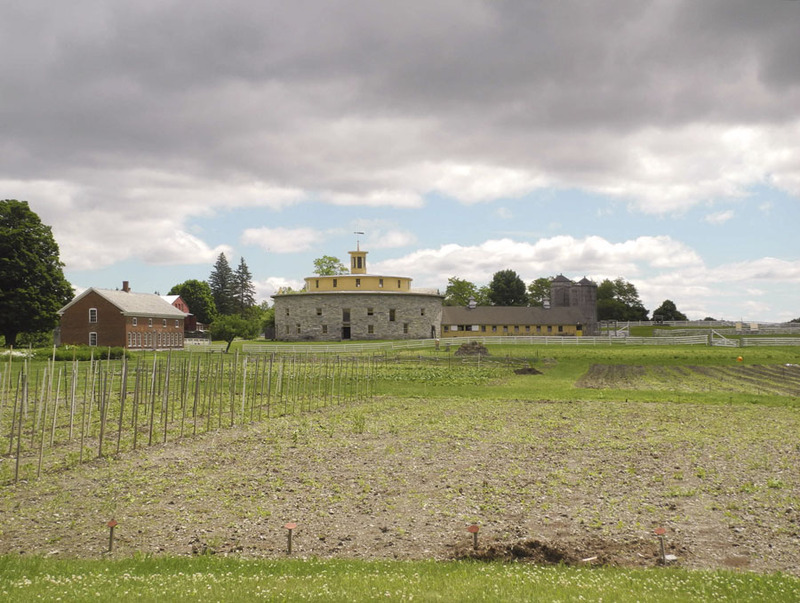 After visiting the Hancock Shaker Village, I felt that the life here had great value to its members, but with no childbearing and no connection to a major religion, I suppose it was inevitable that it couldn't sustain itself. It was very moving to walk among the buildings and see the artifacts of a now vanished community, artifacts of utility and beauty. 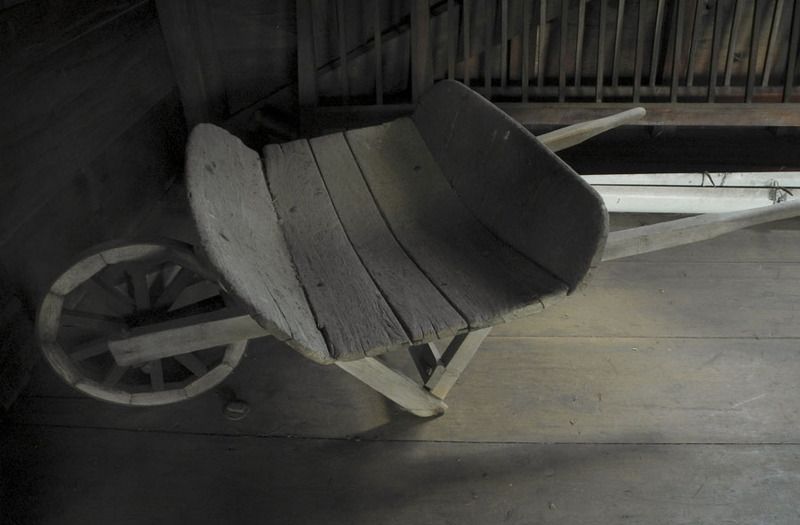 This simple wheelbarrow, made wholly of wood, resting among many other objects on the upper floors of the machine shop, touches my heart as I think of the bent backs moving the loaded tray, just as I do now with my red metal one. 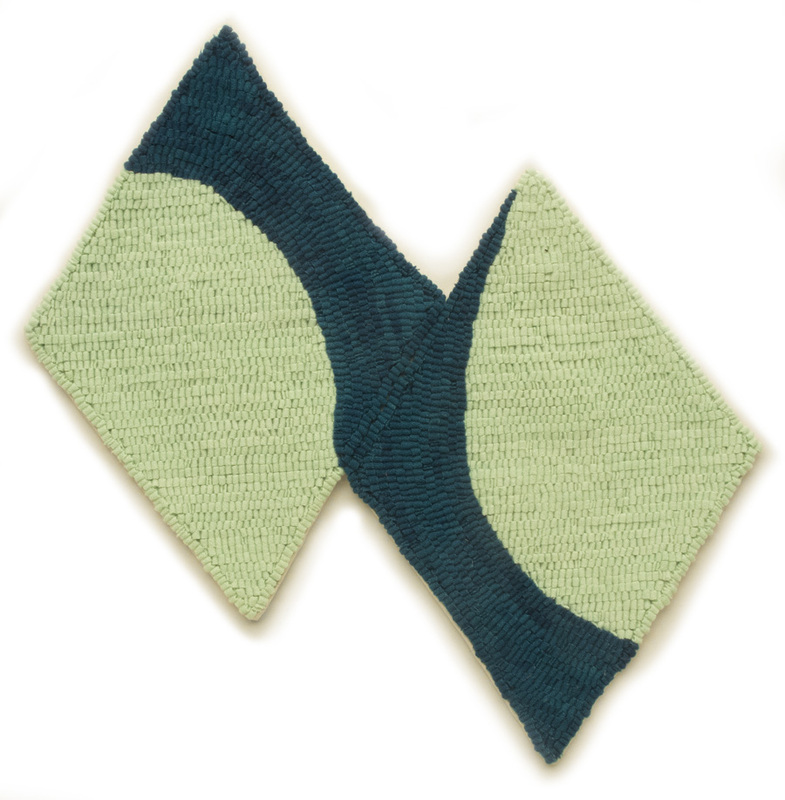 A New Textile: "Double Diamond"
Double Diamond, hand dyed wool on linen, 17 3/4 x 17 1/4 in. There are often quirks of execution in making my textile pieces; I've learned to embrace them instead of being upset. In this work, which is made of two diamond shaped parts sewn together, the upper center outer line has a dip in it instead of being straight. in addition, the dark curve of that piece was not meant to have that little bulge at its bottom edge; it was meant to be a smooth curve. It turns out that I like that little blip, that it makes a good transition to the descending line of the right diamond. And that curving line? maybe it emphasizes or enhances the curving lines within the form, or creates a different kind of tension. Whatever it does, I accept it. 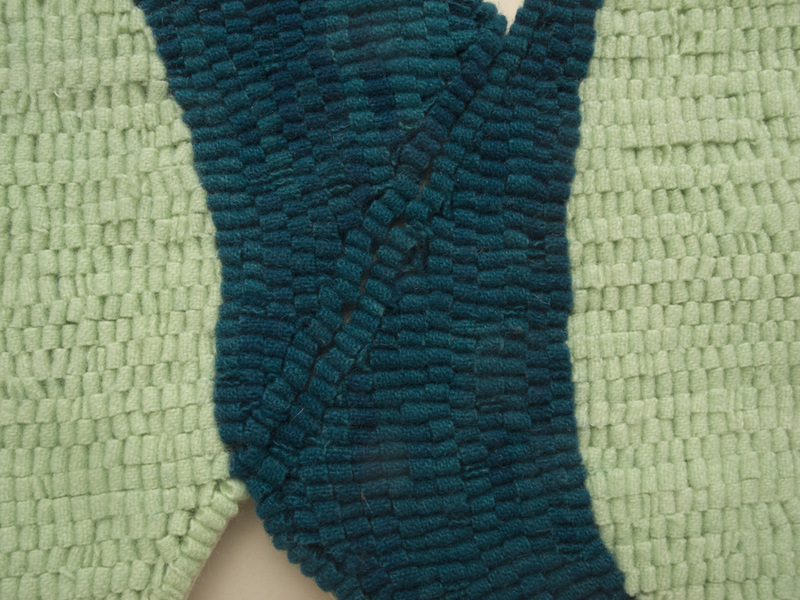 This detail shows the area where the two parts of the work are sewn together. I could have chosen to make this work as one shaped piece, but there's a different feeling that comes from the parts stitched together, an insistence on their separate yet together existence, that I like. The Shakers believed in dividing labor into "women's work" and "men's work", particularly because they wanted to keep men and women separate. Women and men had their own workshops. However, the duties of Shaker men and women were more similar than men and women in "the world" because Shaker women ran businesses for communal family income and Shaker men shared equally in child care by raising the boys. 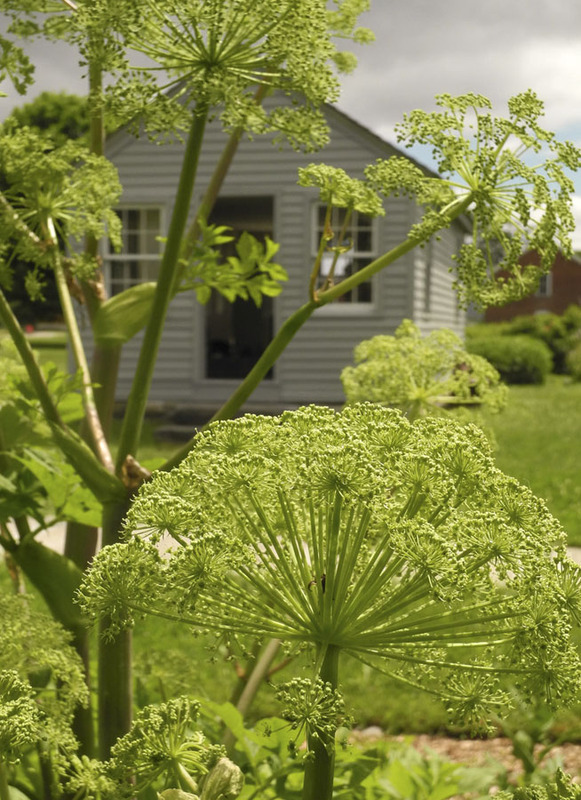 An important Shaker business was the selling of medicinal herbs and remedies. I assume that men did the gardening, since they did the farming, but women may have helped in the gathering and packaging. In an interesting article on Shaker herbs at Mother Earth Living, which quotes Elisha Myrick, a Shaker brother at Harvard, MA, who wrote in his journal of 1850: "Seven sisters and 4 brethren go out beyond the depot to pick wintergreen, get a small quantity." 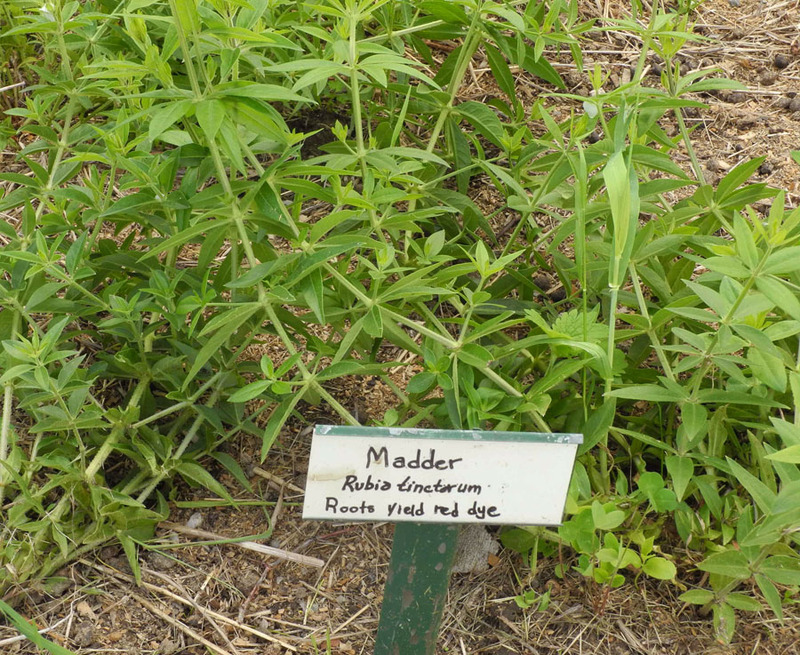 In addition to small herb gardens at the Hancock Shaker Village, there was a garden with dye plants such as Madder and Woad and Coreopsis tinctoria. 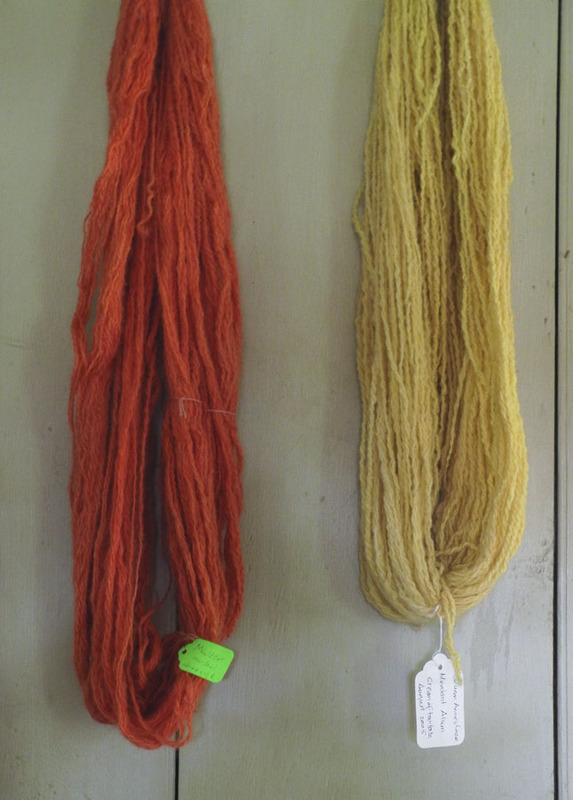 These natural dyes were used to color spun wool that the Sisters then wove into cloth, an important aspect of the Sister's work. On the left is wool dyed with Madder, on the right with Queen Anne's Lace. Flax was grown for linen. 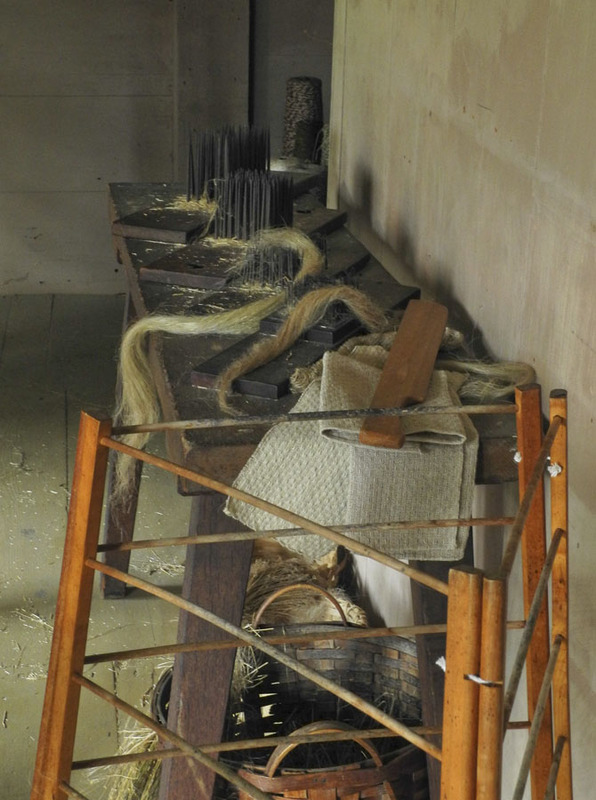 The spiky implements you see above are hatchels which are used to comb the flax fibers before they are spun. Here is a link to a video with shows the process of breaking down the flax stems and preparing the fiber for weaving. The Shakers were adamant about manufacturing their own cloth from the moment their communities were gathered into order. Additionally, they sold textiles and associated goods to the outside World. Members of the New Lebanon, NY, community were in business as clothiers serving both their community and non-Shakers. Over time the Shakers came to rely on outsiders for their cloth. Brother Isaac Newton Youngs, writing in 1856, stated that "in early times of the Chh....there was very little cloth purchased from the world. The making of our own cloth has greatly diminished, owing greatly to the increase of factories, in the world, which enables us to purchase cloth cheaper than we can make it among ourselves, tho' the cloth generally is not so durable as home made." Although they were self sufficient, as shown in the above quote, the Shakers did not shy from modern conveniences, installing electricity when it became available, buying an automobile and building a garage for it. The making and sale of woolen cloaks was a business of the Sisters at Hancock from the 1880s until the 1940s. They were very popular out in the World: President Grover Cleveland's wife wore a Shaker cloak to his inauguration in 1892. Then there was the mundane task of the laundry, which was the job of women. The laundry was housed in the same building as the men's machine shop, and both were powered with water turbines, the water coming from a reservoir. The Sisters rotated through the various chores each month, so no one was permanently assigned to one job. 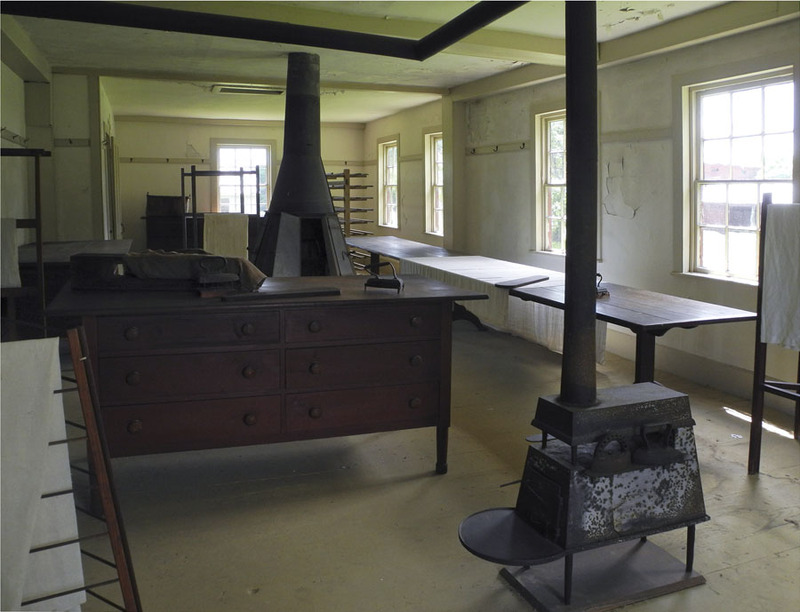 This is the ironing room, with stoves for heating the irons, and long tables for the work. The dairy was another important aspect of Sister's work. They made butter and cheese and their products were known for quality throughout the Berkshire region. Then there was the cooking: women prepared food for the community of one hundred people. 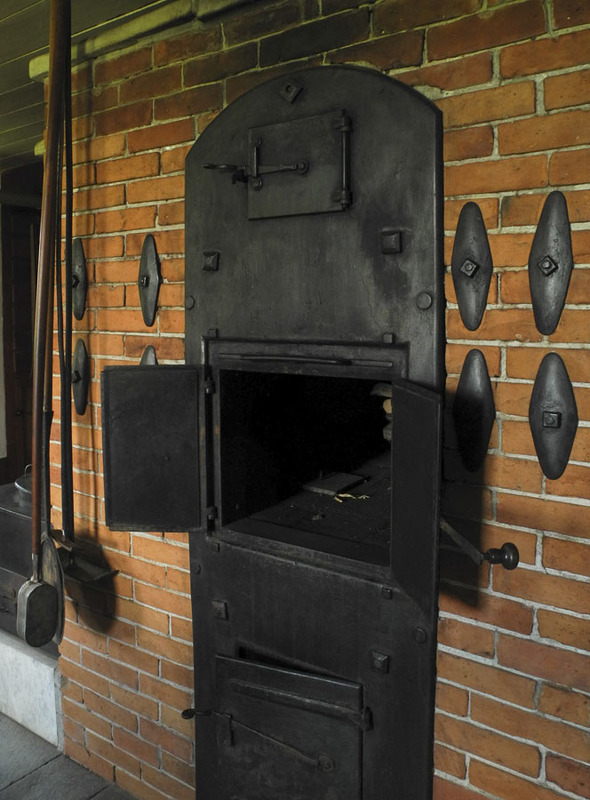 The stone floors and oven designs were up to date and efficient. Enormous kettles could prepare large amounts of food. When I was visiting the museum, a volunteer was baking a cake from a Shaker recipe. I noticed that none of the ovens were heated for baking, so I asked her where the cake would be cooked: "oh, we have a modern oven" she replied. 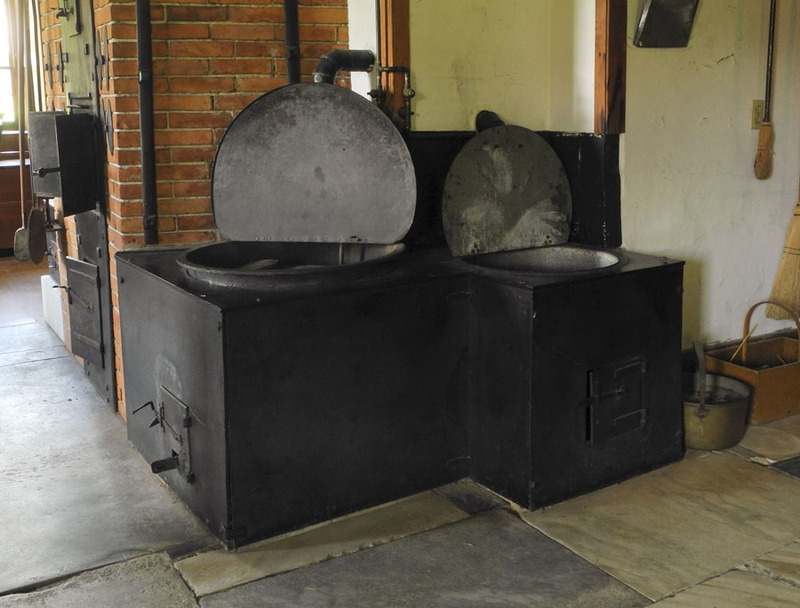 When the community became smaller and moved into the 20th century, the Sisters had more modern appliances. We don't see them at the museum because it is set up as life in the community would have been in the mid 19th century. I suppose that this is one of the questions in historic preservation: which era of an ongoing, living community do you choose to represent? 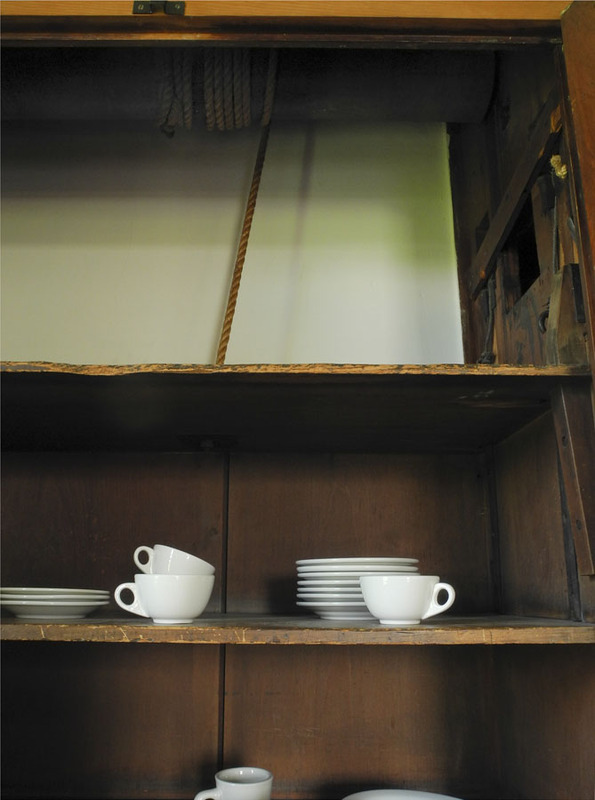 The food cooked in the cellar of the Dwelling house was carried up to the dining room by the use of dumb waiters, or "sliding cupboards", as an Elder described them in 1832. 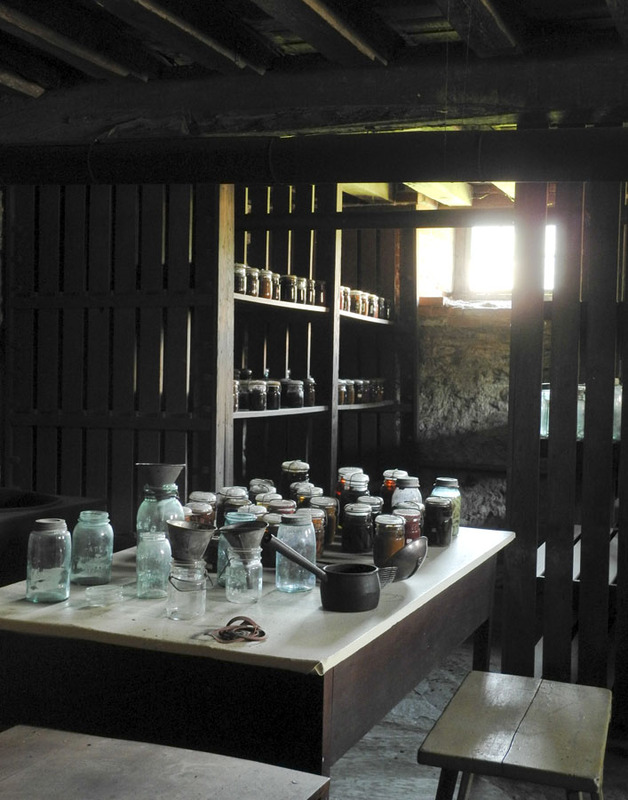 Lastly, I feel right at home looking at the canning jars and the shelves laden with preserved food. This is a technique that hasn't changed: place hot food in jars, seal, boil in a water bath, then cool. The only change is that paraffin wax was used to seal the jars and now we have self-sealing lids as a modern convenience. 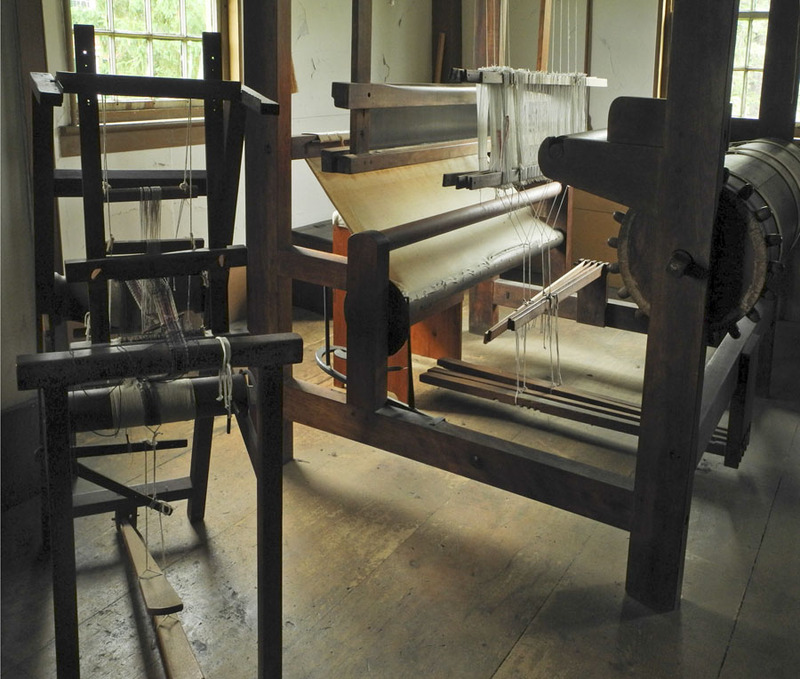 As with dyeing wool, where I now work with simple acid dyes instead of the more complex natural ones, the process is similar, creating a link to time gone by; the lives lived by Shaker women were so different from ours, but there are places where our understanding can bridge the years and the differences. 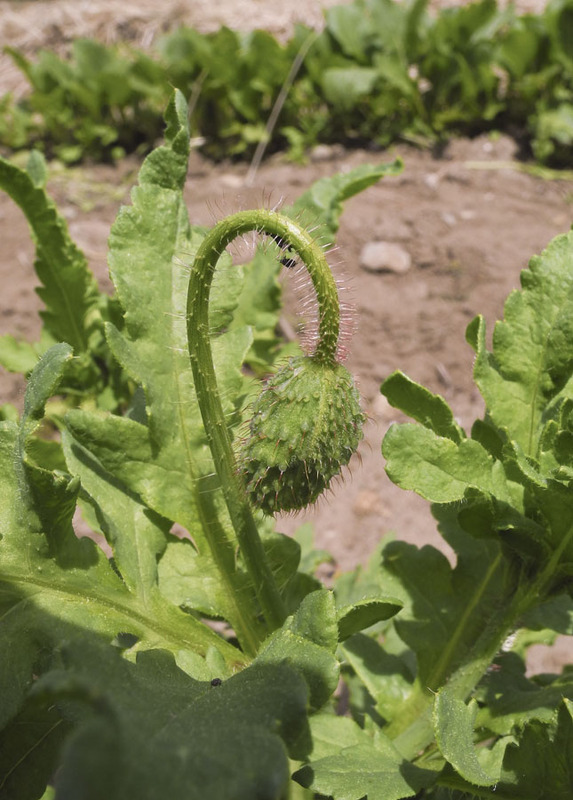 The Oriental poppy buds stand up large and tall, irregularly rounded and bristling, their central indentation announcing a coming opening. They look forbidding and fierce, warning off predators. 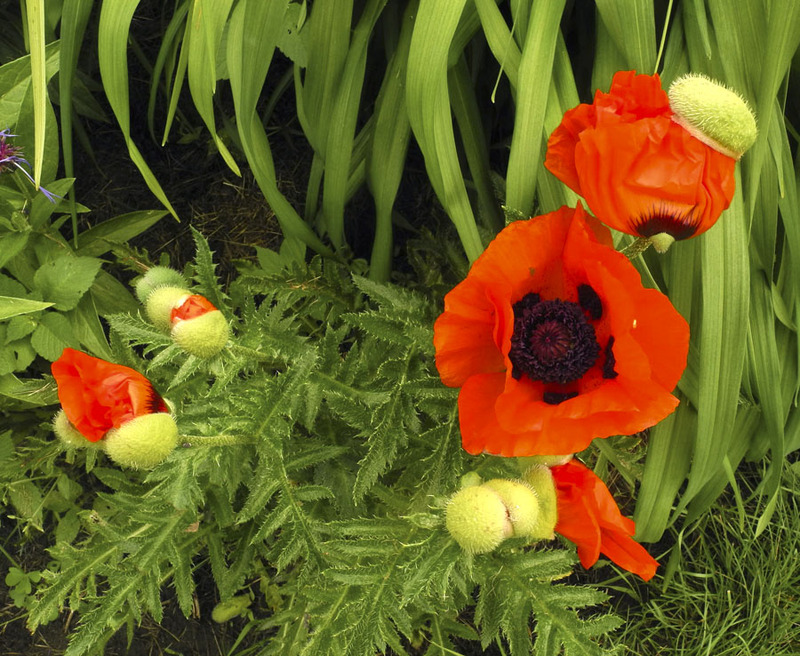 How different are the buds of the annual Shirley poppy: though also spiky, the bud is small and shy, bowing its head before the world. 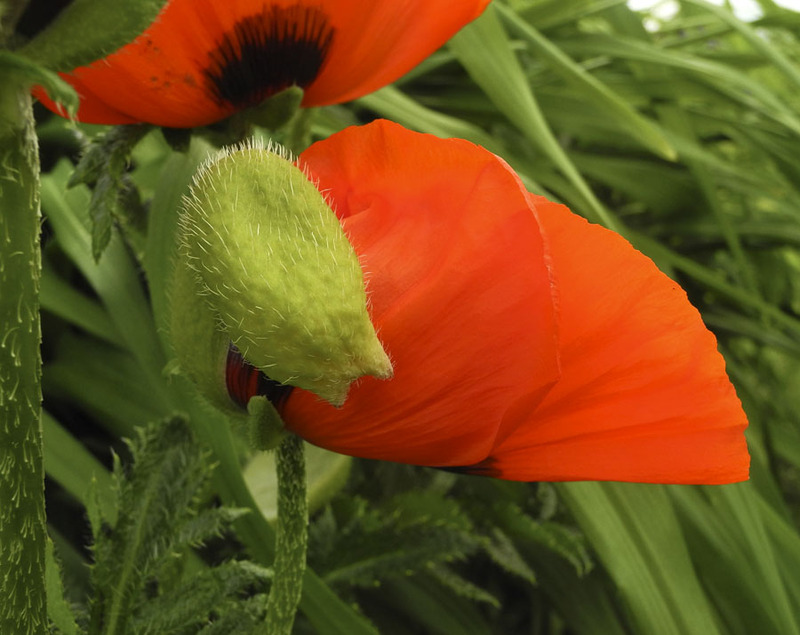 I photographed the buds on Monday; on Tuesday morning I was surprised to see many of the flowers had opened, the one at the top right still wearing its little cap of protective bud. 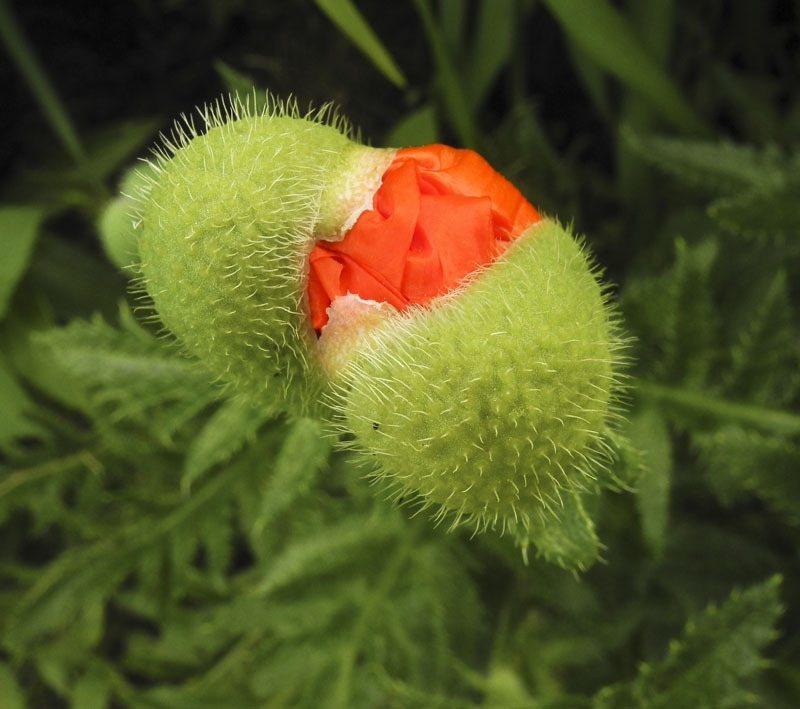 The bud has split and a little bit of folded scarlet petal shows. ....or flow outwards, a fan opening. 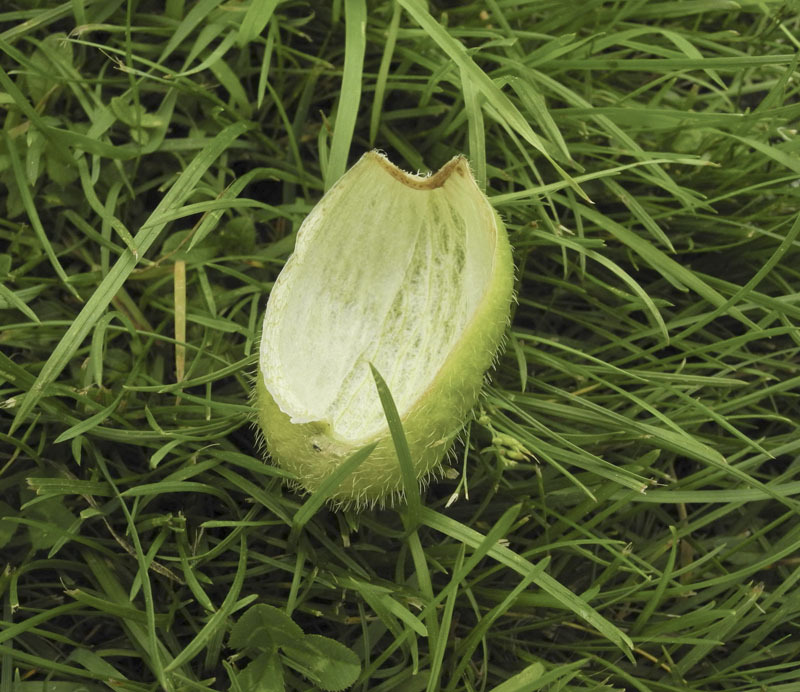 ...while the fallen cover of the flower lies on the grass like a seashell on the beach. 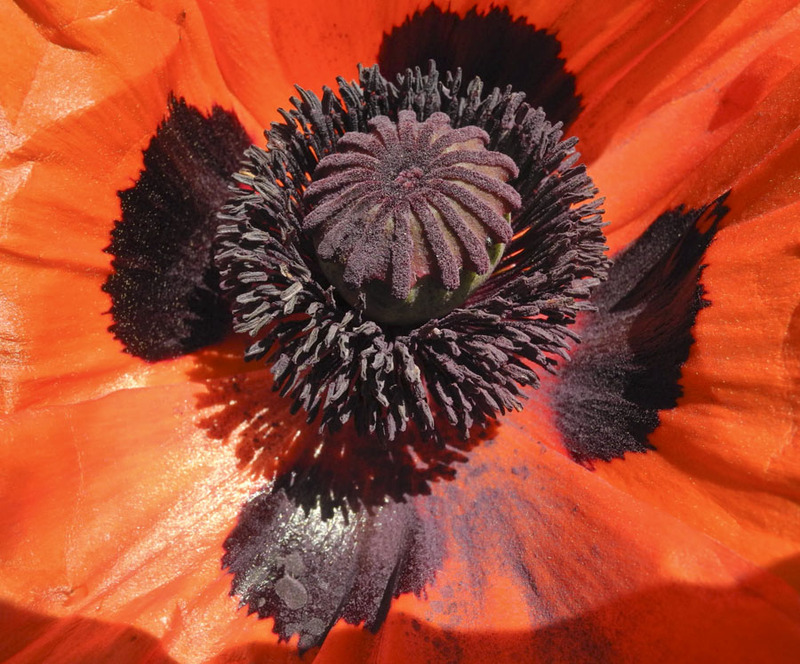 Looking inside the opened flower, the pistil and stamens are royally beautiful, an Oriental ruler wearing a turbaned crown, and with a high elaborate ruff. 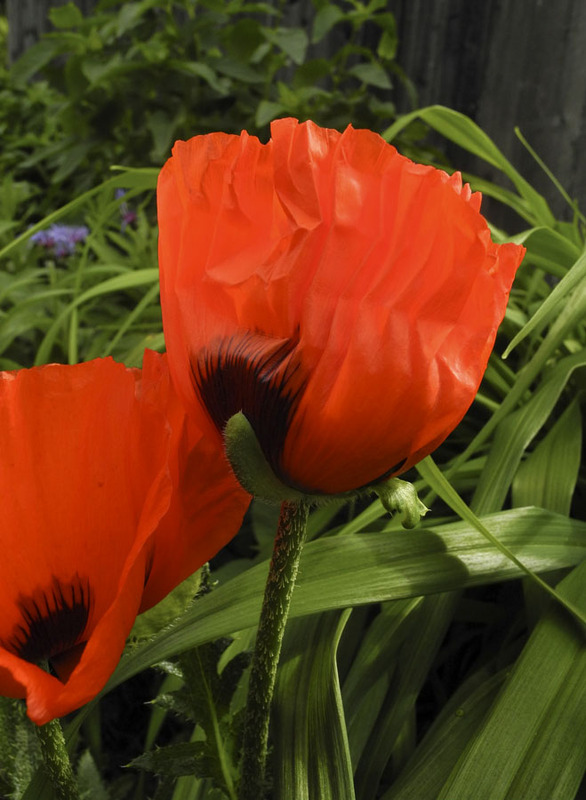 They sit inside a royal red, seemingly delicate and papery, yet tough, and resistant to the winds of change. A New Painting: "Red Hose"
A New Textile: "Red Bars"